Lessons in the art of espionage aboard Mademoiselle Geraldine's floating dirigible have become tedious without Sophronia's sweet sootie Soap nearby. She would much rather be using her skills to thwart the dastardly Picklemen, yet her concerns about their wicked intentions are ignored, and now she's not sure whom to trust. What does the brusque werewolf dewan know? On whose side is the ever-stylish vampire Lord Akeldama? Only one thing is certain: a large-scale plot is under way, and when it comes to fruition, Sophronia must be ready to save her friends, her school, and all of London from disaster - in decidedly dramatic fashion, of course. What will become of our proper young heroine when she puts her years of training to the test? 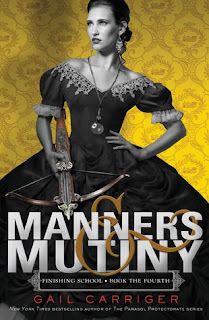 Did you know I LOVE Gail Carriger's world? I'm pretty sure I've said that a time or two. It's steampunk. It's history. It's paranormal. It's filled with fierce, strong, intelligent women. And it's an adventure from start to finish. I'm sad that this adventure is ending. Book the last. All of the tension between the school, the Picklemen, and the supernatural forces residing in London have come to a head, and Sophronia is the only thing standing in the way of complete chaos. Recap - Sophronia is attending Mademoiselle Geraldine's Finishing Academy for Young Ladies of Quality. It's a spy school in Victorian London hosted in a flying dirigible with vampire and werewolf professors. Yes. It's that kind of awesome. Sophronia uncovers a conspiracy against the school by the Picklemen (interested in gaining wealth and power) who have hired flywaymen to steal a prototype that will allow them to control mechanicals (which are basically robot assistants). In this final volume, the fight comes directly to the school and Sophronia must use her intellect and skills to stop the Picklemen from obtaining the prototype and stealing the school. Luckily she has the help of her friends. Carriger offers witty dialogued excellent described action scenes all focused on a central female character. All of the girls, even the most unlikely of students, have talents and strengths that keep them alive. There are no damsels in distress in this book, and that's why I love it. And most importantly, the love stories don't take away from that. It actually makes the girls stronger and more independent. This is an excellent selection for teens and adults looking for good, clean, fun storytelling. And now I need to go back and read The Parasol Protectorate series set years after Sophronia's escapades. And the audiobooks are spectacular if you like that option. I listened to ALL of them...and yet I own all of the hardbacks. The covers are beautiful and look fantastic on my bookshelf. It's too much, my readers. Too much. Gail Carriger is following me on twitter :)!